EDExams was developed in August 2015 after two of the UK's top educational awarding bodies expressed a need for an online secure examination/assessment platform which allows you to create and deliver examinations/assessments through a locked down application without the need for an internet connection. EDExams offers a secure and locked down examination and assessment application for the delivery of secure locked down examinations. Once the application has been downloaded on to a computer the application is self updating hence once its on its on. Once the paper has been uploaded on a central computer the application no longer needs an internet connection. We are very proud of the application we have developed in terms of security. Once the application has been launced and the exam started the student will not be able to move of the screen. Meaning the exam is fully locked down. 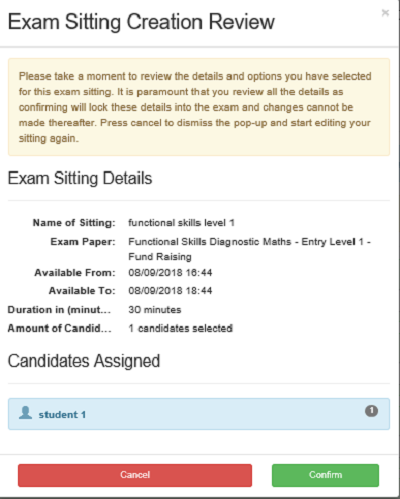 The application is designed to place its self on the front of the screen and no matter what you do it will not move whilst the exam is in progress. Believe you me we have tried everything !! This allows an awarding body to offer safe, reliable, secure off line examination on an application that offers no advantage or disadvantage weather the examination is sat on paper or online. The number one prioroity when building the application was that their cannot be any advantage or disadvantage to either sitting the examination online or on paper. We have worked hard in our development to make sure we stuck to this. EDExams allows for the creation of online examinations/assessments in no time using our examination/assessment builder. The system allows you to choose whether you require the use of a doodle pad or a calculator. EDExams is easy to use from the creation of the papers to the administration to finally the results. The whole system is designed with the user in mind. EDExams offers a wide range of question types and settings to accommodate every situation. When using a multiple choice questions the platform will automatically mark and grade the examination/assessment for you. The platform allows you to set pass and fail grading sets depending on the difficulty level of the questions. You can even let your students know if they have passed or failed directly after they have taken the examination/assessment or save the results for later. You can create practice tests at the end of each subject studied to test the knowledge and understanding of the student. You can provide feedback for each question. You can show them their test paper and give an explanation about each question so they can see their gaps in knowledge allowing you to implement intervention strategies if required. EDExams has a bank of principle examiner written mock papers ready to use in the system. The marking can be carried out by our in house markers or internally. The exams can be sat in examination controlled settings with full diagnostic feedback including time taken to answer each question. You can easily see the progress of each student in the diagnostic reports the platform produces. You can see individual answers and results for each question and has a cohort of students. This allows you to see where their are gaps of knowledge and more work is required. The system will show you where intervention is required for a student and where students have improved with this intervention. Allowing you to show clear assessment points and progress for Ofsted. The diagnostic tools allows you to look at either and individual students results or a cohort of students. We offer bespoke tailored packages for all our clients. The platform can be developed to all your online examination/assessment requirements.